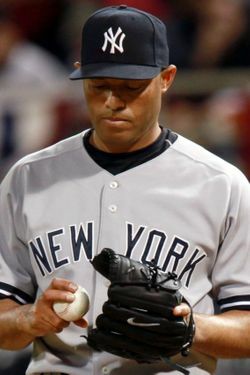 In 2010, a perfectly fine season for Mariano Rivera, the Yankees closer recorded saves in 87 percent of his 38 opportunities. Over the course of his career, he has earned saves of 89 percent of his 634 opportunities. So statistically, a night like last night was bound to happen sooner or later: Rivera blew his first save of the year, in his eighth opportunity. His 2011 save percentage, through his first eight chances: 88 percent. Not that it's any less jarring to see Rivera struggle, especially to protect a two-run lead. But thanks to a double, a ground out, a wild-pitch ball four, a single, and then a bunt single, the Jays scraped together two runs off Rivera before he induced an inning-ending double play to at least preserve the tie. An inning later, then, Ivan Nova would surrender the game winning double to Travis Snider — the same Travis Snider who, earlier in the game, broke his bat in half over his knee, after striking out for the third time — giving the Blue Jays a 6–5 victory. A.J. Burnett, who'd been in line for the win, didn't get a decision — we fear he may not win more games than the Boston Red Sox this year, unfortunately — and though he lowered his ERA by allowing three runs (only two of which were earned, because of his own throwing error) in five and a third innings of work, he also allowed six hits and five walks to go along with his six strikeouts. (And for what it's worth, those numbers could have been a lot uglier if David Robertson didn't strike out two batters in relief of Burnett with the bases loaded in the sixth, including the strikeout that caused Snider to go all Bo Jackson on his poor bat.) More often than not, though, the Yankees will win a game like last night's, in which they score five runs, the middle relief does its job, and the starting pitcher isn't an utter disaster. But every once in a while — approximately 11 percent of the time, history tells us — Rivera won't close it out. He is, after all, only human.